What exactly is the Kremlin? From the time I was growing up, learning about world politics, and enduring the Cold War, I heard about Russia, and their Kremlin. In fact, I heard more about the Kremlin, than I did the White House. The Kremlin is located in Moscow, and is considered a mythic refuge, a self-contained city with palaces, armories, and churches. Think of it more as a medieval fortress, linking their legendary past with the modern nation of today. It is opulent, as well as austere, alluring and enigmatic. Long story short, credit the Bolsheviks for shifting the power back to Moscow from St. Petersburg in 1918. The charm of the centuries old Kremlin today lies in its roots with Tsarist Russia. Cathedral Square is where the spirits of Ivan the Terrible, Boris Godunov, and the early Romanovs haunt not only visitors like me, but also the likes of Stalin, Lenin, and even Maria Sharapova. The Kremlin Arsenal is where Peter the Great manufactured and stored weapons. After Napoleon Bonaparte and his Grande Armee left town, the Armory became a museum in honor of the Russian victory. The Armory is now the headquarters of the Kremlin Guard. The State Kremlin Palace was completed in 1961, as its newest, most modern structure. It was built in the glory days of the Khrushchev reign to host Commie Pinko party congresses. Its most prominent feature is a 6000 seat auditorium with a stage featuring a monumental head of Lenin. Today, it is used for the Kremlin Ballet, and Lenin’s head is long gone. Perhaps I should look for it on eBay or Craig’s List. As my train got closer to Moscow, the number of Lenin statues increased from stop to stop, and along the many stations where we did not stop. And, as another indication of life here, young kids jump onto the outside of commuter trains. They hold onto the windshield wipers, and just go along for a free ride. Why? Because they can, and nobody bothers to stop them! The Senate is a neoclassical building commissioned by Catherine the Great. It was designed by famous Russian architect, Matvey Kazakov, no relation to Seinfeld’s Yuri Testakov. Originally intended to be a meeting place for Catherine’s advisory council, it became Lenin’s office. Though his offices were preserved, the Senate serves as the official residence of the President (Pooh-tin). Not everything here is normal. 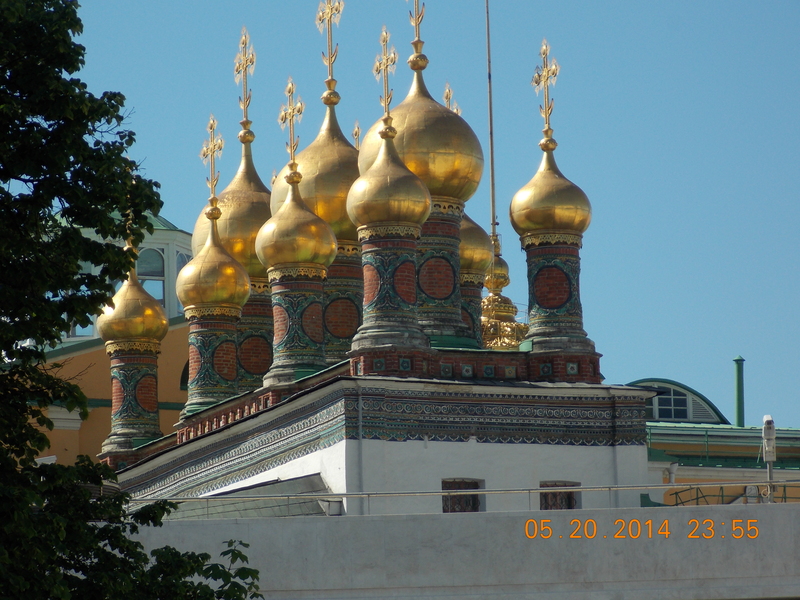 A large pair of strange non-working curiosities adorn the Kremlin. One is a 40 ton Tsar Cannon built during the reign of Ivan the Terrible’s son, Fyodor in 1586. The barrel is more than five meters long, with a caliber of 890 millimeters! The projectiles would have to be the size of wine casks. The second is a two hundred ton Tsar Bell, the largest in the world, but never completed. Personally, I would hide both from public view. Cathedral Square serves as the symbolic heart of tsarist rule. The center piece is the impressive Cathedral of the Assumption, built in the 1470’s by Ivan the Great, as the seat of the Russian Orthodox Church. Cathedral Square was the focal point of political power until Peter the Great moved the capital from Moscow to St. Petersburg in 1710. Clustered around the Square are a series of cathedrals, towers, and palaces that make up the history of the period. But the most dominating structure over Cathedral Square as well as the Kremlin is the Ivan the Great Belltower. At a height of over 80 meters, its construction began in the 16th century and was completed in 1600, during the reign of Boris Godunov. 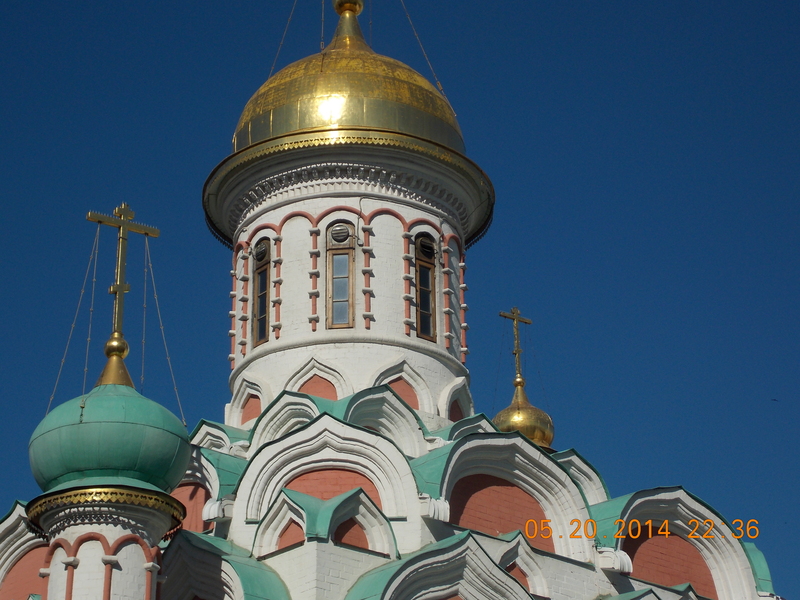 The Assumption Cathedral is the oldest and largest of the Kremlin’s many churches. It was originally the site of a small church built by Ivan I in 1330. But Ivan the Great decided it was not grand enough. He hired Italian architect, Alberti (Aristotle) Fioravanti from Bologna in 1475. Four years later, Fioravanti completed the giant cathedral, and was awarded with imprisonment. It was here on the steps that Ivan tore up the charter binding Russia’s princes to the Mongols. Nevertheless, this cathedral is the star among many stars in the Square. Some of the other structures are: Cathedral of the Deposition of the Robe, Cathedral of the Archangel Michael, Cathedral of the Annunciation, Cathedral of the Twelve Apostles and the Patriarch’s Palace, The Terem, Faceted, and Great Kremlin Palaces, and The Armory. 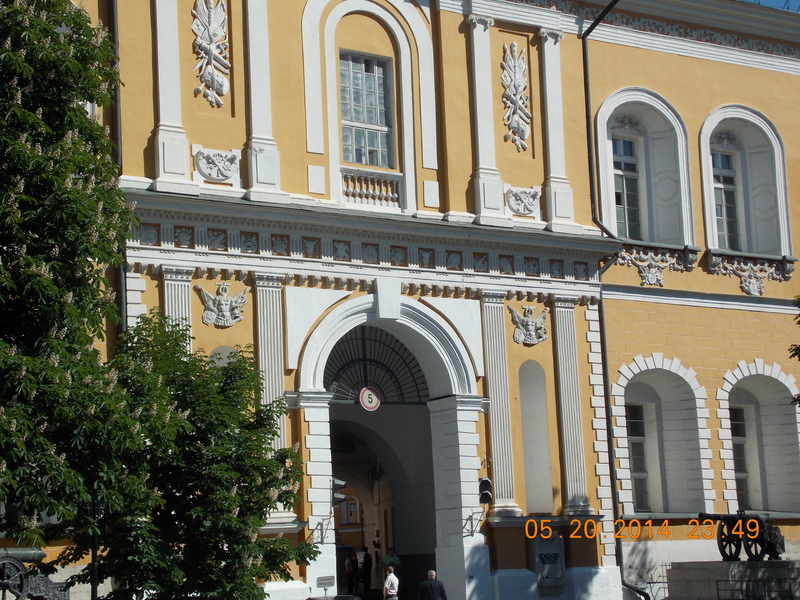 The Terem Palace is the oldest building in the Kremlin. The Great Kremlin was the Moscow residence of Nicholas I. Neither have yet to open to the public. In fact, two-thirds of the Kremlin is closed to visitors. 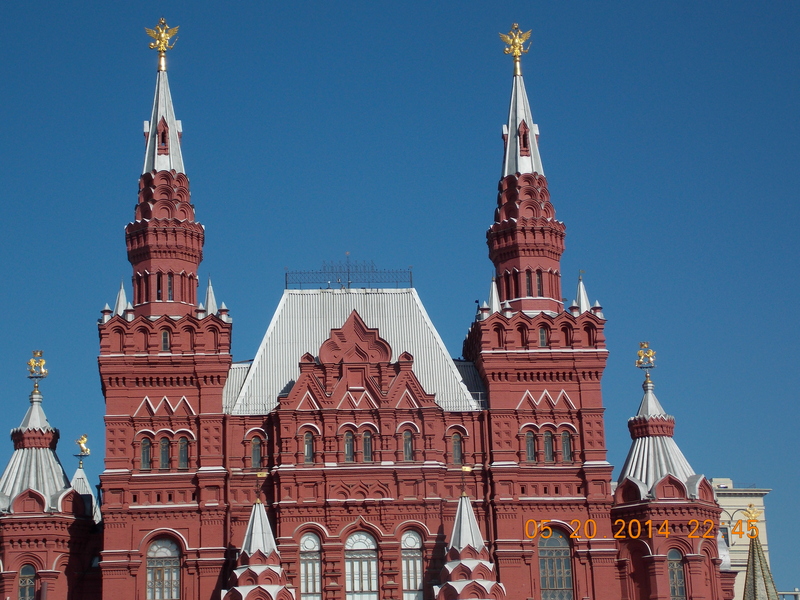 Red Square is closely associated with the Kremlin, lying beneath its east wall. It is still the heart and soul of Russia. That is the subject for another email. The Kremlin complex is an impressive and truly magnificent array of buildings, perhaps rivaling the great Angkor Complex in Cambodia. It is certainly larger and grander than the White House or the Vatican. It has been a power center for over 800 years. It is a UNESCO World Heritage Site, and one of the most popular places to visit in all of Russia. I am really impressed. It is both beautiful, and breathtaking. I am so glad to be here.